My hip replacement surgery date keeps being pushed back by more urgent cases. It's going backwards at the rate of 2 months every month - current estimate is October/November (it was supposed to be this month!). This is because I'm listed as a Category 3 patient (non-urgent), so anyone at a higher need pushes me down the list. Unfortunately Canberra has the longest waiting lists in the country, at the moment. Karen made the very sensible suggestion of seeing my GP to have my category revised - I think I'd qualify as a Category 2 now (surgery within 90 days), as my level of disability is increasing daily. I need to use a 'sock aid' to put my socks on now, am in pain most of the time, and am using a walking stick whenever I'm out. I'm also needing extra pain killers to sleep through the night. So I'm seeing my GP tomorrow. Fingers crossed! 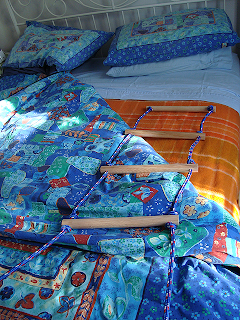 I wanted to show you something clever my husband made for me - a bed ladder! It's basically just a rope ladder with dowel rungs. 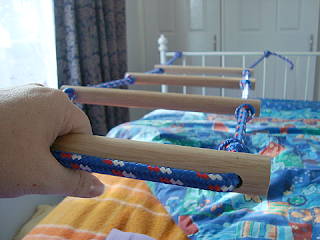 You tie the ends to the foot of your bed, and use the rungs to 'climb' yourself into an upright position. An easier and cheaper solution than those overhead 'trapeze' grips, like is used in hospital. I'll use this once I'm home from hospital and needing help to sit up in bed. The main downside of this design is you still need to have someone position the ladder on top of the bed, while you're in it, it's not so easy to get into position yourself when in bed. Hmmm, maybe there's a way of letting it hang down the side, and adding a tether to hold it in position? 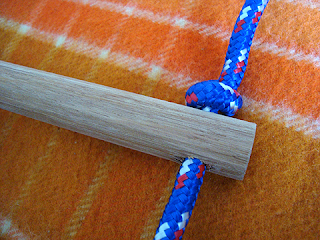 There is a rather nifty cloth strap version which has solved this particular problem. I'll have to see what improvements we can make! 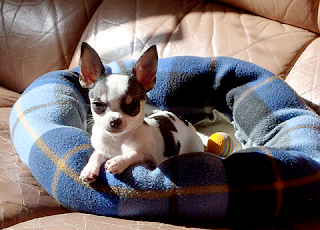 Chihuahuas are solar powered puppies - this is her favourite spot in the mornings, up on the couch, in a little cushiony bed, with her ball, in the sun! Miss Petal is just the cutest thing out!!! I hope you get 'upgraded' to the next level. I like to be grateful for out good health care, but I am cross when people are pushed down the queue when they need help. Love the ladder!! I could do with one of those for getting up too!! You must get upgraded. You can not go through this waiting for another 2 months let alone 6-8. That is a nifty contraption hubby made for you. I can still seeing you needing the overhead monkey thingy. Health care...you know they are working (fighting) to make sure all have care up here and with private insurance we are paying out the nose but we do not have waiting times like you. Then again your surgery is very specialized. Solar powered Petal, how cute. Your surgeon has a very smart nurse. Best of luck on your upgrade. Don't be a brave little soldier about this. Write down all your complaints and take the list with you so you don't forget a single thing. Remember, it's the squeaky wheel that gets the grease. And you NEED the grease right now! Petal the solar pup is adorable! Your hubby rocks! That is a great ladder and yes, a good "cop" for the drill! That Petal gal looks so comfy and cozy in her new bed, right at home. Ay! I'm so sorry to hear you're in so much pain - I do hope you get bumped to a category 2 and can get the surgery sooner! Love the Petal pic! So cute! In the midst of all your difficulties I had to laugh. My DH would do the same thing: build me something useful because it required buying a new toy/tool. I am keeping my fingers crossed for you. I really hope that you get upgraded. Big Hugs from across the water.